New data on heat-related deaths suggest that public health officials have been underestimating them, the Centers for Disease Control and Prevention says. It’s an especially important message as summers get longer and hotter due to climate change, and as storms that can cause widespread blackouts become more common and more intense. More than 7,200 people died from excess heat from 1999 to 2009, Ethel Taylor and colleagues at the CDC found. The latest numbers, part of the CDC’s weekly report in death and illness, list non-residents for the first time, a group that includes illegal immigrants, tourists, migrant workers and others. These groups suffer especially when it gets hot, Taylor says. “About 15 percent of the heat-related deaths we have seen over 10 years are occurring in non-US residents,” Taylor told NBC News. This adds up to about 1,000 people. The CDC is now trying to find out just who these people are and why they’re being killed disproportionately by heat. Forty percent of the deaths over the 10 years were in just three states – California, Arizona and Texas. They are all border states in the south with plenty of desert and agriculture, so the victims could be illegal immigrants who died trying to cross the border, farm workers, or rural poor. Taylor says it’s important to get more information about them. Awareness of the dangers is important because longer, hotter and more extreme weather is here to stay, the CDC’s George Luber says. “The most serious hurricanes are increasing in frequency….and that is driven by climate change,” Luber says. Weather experts stress that it’s impossible to say whether any individual storm or heat wave was caused by climate change. But the patterns are clearly changing and that can certainly be attributed to climate change, Luber says. “The sheer magnitude of these weather events are a challenge to public health,” Luber says. The “derecho” that hit some eastern states last July is a great example of this. The storm blew in on June 29, knocking down trees with tornado-force winds that, as the name implies, blew straight across the land instead of in a twisting spiral. That’s bad, but not nearly as bad as in similar events in years past, says Taylor. For example, a heat wave in Chicago in 1995 killed 514 people, a rate of 9.7 deaths per 100,000 people, and a 1993 heat wave in Philadelphia killed 118 people, or 7.5 per 100,000. Most were found in their homes, and often the victims either had no air conditioning or it was off. Fans alone are not enough to keep people healthy during extreme heat, CDC says on its new website on heat. Elderly people may not recognize they are at risk. Forty percent of those who die from heat are 65 or older. Symptoms of heat illness can be subtle and people can be seriously ill before they even know they are in danger. Heat exhaustion is marked by heavy sweating and exhaustion – both symptoms that people may see as normal when it’s hot. Extra warning signs include cold, clammy skin and a fast, weak pulse, nausea or fainting. Heatstroke is a more immediate emergency – body temperature soars to 103 degrees or higher, the pulse gets faster and the skin may turn red and dry. Heatstroke can cause deadly swelling of the brain, liver and kidney failure; people with these symptoms should call 911 right away, CDC advises. Taylor says libraries, shopping malls and other public facilities often have generators and can be designated in advance to use to help people cool off in extreme heat – especially during power outages when their own air conditioning doesn’t work. And individuals should have plans, also – where to go in case of floods, where cooling centers are if there’s a heat wave and they don’t have air conditioning. “If the air conditioning goes out, I need to understand where I can take my kids to cool off,” Luber says. “We wants sports coaches to understand, a communities need to know where their most vulnerable populations are.” In cities, multistory brick buildings with no air conditioning can be death traps in a heat wave, for example. 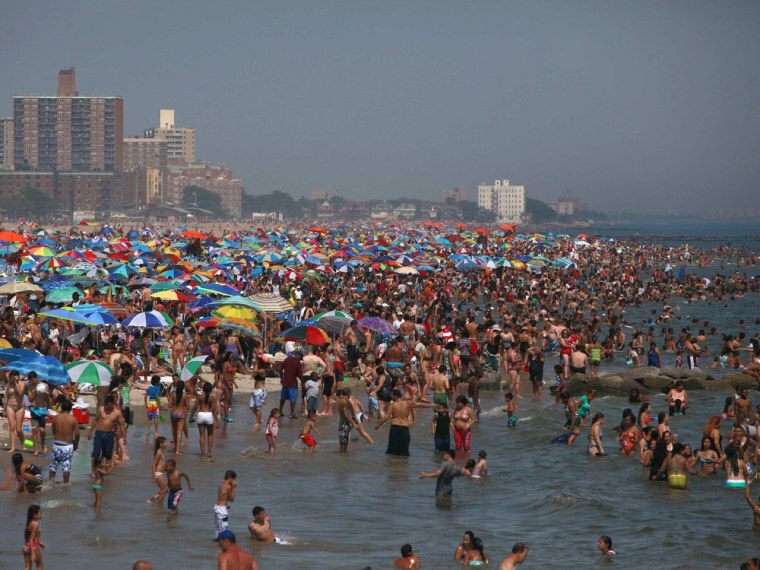 Heat waves are often associated with stagnant air and air pollution, Luber adds. This puts people with respiratory conditions at higher risk – those with asthma or breathing problems, as well as people with heart conditions.